In the Society for Creative Anachronism, we are a collective of volunteers, each serving in their own way at one point or another so that all may have a chance to play, enjoy, learn and have fun. It is on this mantra that the SCA has gone on for 50 years now, and shall continue to do so. As we Celebrate 50 Years of the Society, many of our SCA family will be considering attending the SCA 50 Year Celebration Event, June 17th through the 27th of this year and many of them will be giving their time and service to the event, staffing the Gate, serving on the Watch, Marshalling the Lists. We wish to show appreciation to the Volunteers who give of themselves, from the newest member giving their first hour of service to the Multi-Peer who serves alongside that newest member. The Society works because our Volunteers continue to turn the wheels and drive us forward to fun, adventure, knowledge and my personal favorites, Family and Friendship. Everyone who volunteers on site during the event will receive a ticket for each hour they serve. These tickets can be dropped into boxes that will labeled with the items you’ve donated: items that our volunteers would proudly use or displayed long after the event is over. And Artisans, this is where you are most needed. We come seeking donations from the Amazingly Talented populace of the Known World: we are asking you to please consider donating handmade items that people would Buy/Trade/Commission for themselves. No matter your rank, Laurel or student; professional craftsperson or astonishingly talented amateur: we’re asking all of you to help us recognize the volunteers in service to the Society’s 50th Year Celebration. Please, put forth your beautiful work to be a cherished gift for a Volunteer. All donations can be mailed to His Lordship Justice ahead of the Event or delivered at the SCA 50 Year Celebration Event if you are attending. Any additional information / description of your item you wish to include (including pictures of our work if it’s a ‘after raffle’ item. As a thank you to everyone who contributes, His Lordship Justice will be doing a raffle of his own. Two artists will be drawn to receive a Gift Card each to get more supplies (or whatever you want to do with the money). We thank you for your time and hope that you will reach out to offer your talent to support the Volunteers who give of theirs for this once in a lifetime Event. Their Majesties Brennan Ri and Caoilfhionn Banri, as well as Her Highness Avelina, did visit the Shire of Owlsherst on 5 March AS L, to attend the occasion of the King’s and Queen’s Bardic Championship. The day began with a short court to send Jamilia al-Suba al-Hadid min Bhakail al-Sheikha and Magnus Hvalmagi to sit vigil to contemplate elevation to the Order of the Pelican and Order of the Laurel respectively. There were many fine bardic performances for two rounds, when the third round was reached with four finalists. Drake Oranwood, Sol la Cantor, Alys Mackyntoich and Æthelflied Brewbane. Not long after these final four performances, on the topic of Valor in a manner chosen by His Majesty Brennan, were complete, Their Majesties did open their court. The Queen’s Bardic Champion, William the Alchemist, was called forward. He was thanked for his service. Her Majesty invited her new champion, Alys Mackyntoich. Alys was presented with the regalia of her championship, a scroll by Ysemay Sterling, and attended Her Majesty in court. The King’s Bardic Champion, Ysemay Sterling, was called forward. She was thanked for her service. His Majesty invited his new champion, Æthelflied Brewbane. Æthelflied was presented with the regalia of her championship, a scroll by Ysemay Sterling, and attended His Majesty in court. All four finalists received tokens from Their Majesties for their entertaining performances. The Princess Royal, Courtney Rose, did wish to present a scroll of her making to a bard she chose as her champion. Thus it was that Lianor de Matos was invited into court to receive her accolade. King Brennan and Queen Caoilfhionn invited representatives of the Shire of Owlsherst to attend court. They were thus presented with fine gifts, and Their Majesties thanks their hosts for their hospitality. Next did Their Majesties invite into their court Ben the Rat Catcher. Though a youth of the Kingdom, they spoke well of his service, and named him a Page to their Court. The Order of the Tygers’ Cub were called forth. Ben received a medallion, and a scroll by Harold von Auerbach. The order was not complete, however. Brennan Ri and Caoilfhionn Banri called into their court Spencer Oranwood. He was made a Page to their Court and inducted into the Order. Spencer received a medallion and a scroll featuring calligraphy by Leonete d’Angely, illumination by Tola Knyttir and words by Alys Mackyntoich. Next did Their Majesties call into their court Sarah-Grace Blakeslee. Though she was not herself present, they presented for her the garter of the Order of Gawain, and a scroll with calligraphy by Aleksei Dmitriev and illumination by Isa of Ruantallan. Her Majesty called forward all those children who had participated in Her Service Initiative. They received tokens for their service. All of the children present were invited before the court. The toybox was run, and as per usual there was much laughter at the joy of the children. Their Majesties next called into their court Emerald Unudottir. They made her a Lady of the Court. She was Awarded Arms, and received a scroll by Elsa de Lyon. Their Majesties invited into court all those attending their first, second or third event. They were thanked for attending, and presented tokens to remember the day by. Brennan Ri and Caoilfhionn Banri next called into their court Jamilia al-Suba al-Hadid min Bhakail al-Sheikha. She answered in the affirmative that she would join the Order, and so the Order of the Pelican was called forth. Suba was elevated to the order, receiving a medallion, robe and hat and a scroll by Saerlaith ingen Chennetig with words by Sabine de Kaerbriant. Their Majesties next called into their court Siobhan Nic Ghadhra. They made her a Lady of the Court. She was Awarded Arms, and received a scroll by Marietta Charay. Their Majesties invited Hashiji Morikatsu into their court. They spoke of his combat prowess, presenting him with a medallion and thus inducted him into the Order of the Silver Tyger. The Order not yet complete, Their Majesties called into court Seamus Mac Neachtain. His prowess well regarded, he was presented with a medallion and inducted into the Order of the Silver Tyger. Their Majesties called into court the companions of the Order of the Silver Wheel. Next was Josceline le esqurel called before Brennan Ri and Caoilfhionn Banri. For his service he was inducted into the Order of the Silver Wheel, receiving a medallion and a scroll by þóra Eiríksdóttir with words in French by Brunissende Dragonette de Brocéliande. The Order still incomplete, Their Majesties invited before them Robert the Tall. For his service he was made a member of the Order of the Silver Wheel, presented with a medallion and a scroll by Onóra ingheann Uí Rauirc. Next did Their Majesties invite into their court Donnchadh Lochlain. He was Awarded Arms and made a Lord of the Court, and further presented with a scroll by Sorcha Dhocair inghean Uí Ruairc with words by Ulrich Reinhart. Their Majesties invited into court Drake Oranwood. Impressed with his performance overall, they named him a companion of the Order of the Silver Brooch. He would be presented with a medallion of the order after court. Brennan Ri and Caoilfhionn Banri next called into their court Magnus Hvalmagi. He answered in the affirmative that he would join the Order, and so the Order of the Laurel was called forth. Magnus was elevated to the order, receiving a medallion, coat and hat and a scroll by Vettorio Antonello, as well as a drinking horn by Frigga with words by Toki Redbeard and Norse poem by Fridrikr Tomasson av Knusslig Hamn. As Their Majesties went to close their Court, Ruslan Novgorodcev demanded a boon. So it was he offered to Brennan Ri and Caoilfhionn Banri his fealty. There being no further business, the court of Their Majesties was closed. Long live the King and Queen! Long live the Prince and Princess! Long live the Kingdom of the East! Malcolm Bowman, Eastern Crown Herald. A thank you to the Heralds for the court. Ysemay Sterling, William the Alchemist, Sabine de Kerbriant, Alys Mackyntoich, and Colin Ursell. Since the publication of the new 2 Hander rules I have received some questions regarding the blade/handle length requirements. I will attempt to offer some clarification. I, as KRM, am specifically empowered to allow weapons that do not meet the standard but still pass the Flex Test. Speaking specifically of the Hanwei feder, it is my understanding that the handle is just about an inch too long for the 2 Hander standard. These specific weapons are allowed under that discretionary power. Any other 2 hander that does not meet the published standard must be cleared through myself, my Kingdom Deputy, or one of my Regional Deputies. Being the Court of Their Royal Majesties King Omega V & Queen Etheldreda IV, held on October 3rd, 2015 at the Coronation of Brennan II and Caoilfhionn II. Court Heralds: Baron Ernst Nuss von Kitzingen, Baronin Maria Erika von Ossenheim. “Unto the Seneschal/es, Event Stewards and Populace of the Laurel Kingdom of the East, from your servant Alayne, East Kingdom Accessibility Porter, greetings and warm wishes for good health! 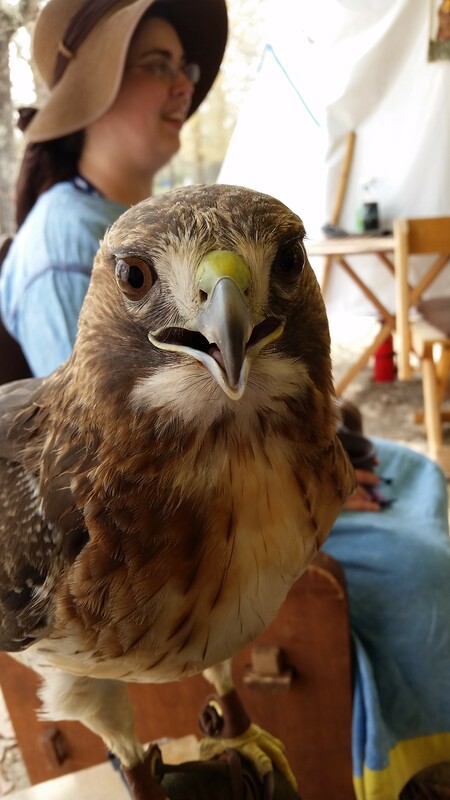 Cinnamon, a Red Tailed Hawk, with Mistress Aife ingen Chonchobair in the background. The East Kingdom is saddened to hear of the loss of the Calontir Falcons on the way home from Gulf Wars. Master Freiderich von Blumenkamp of Calontir, Lady Lora Ann Rós and their son Liam’s car caught on fire on the return trip. Although all the humans escaped safely, unfortunately, none of the birds escaped. 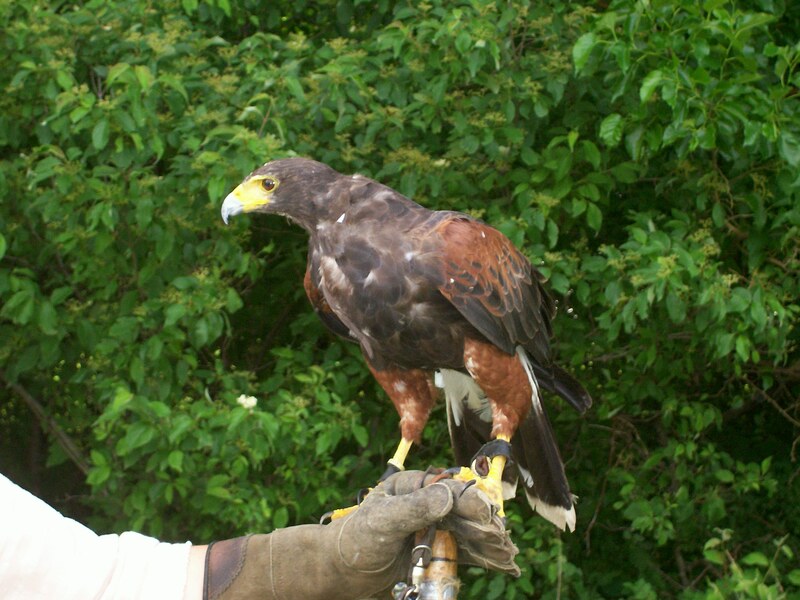 Artemis, a 21 year old Harris Hawk, Cinnamon a 5 year old Red Tailed Hawk. Winter a 4 year old gyrfalcon, Lady a 16 year old Aplomado falcon and Ra’n, a 4 year old American Kestrel died in the fire. 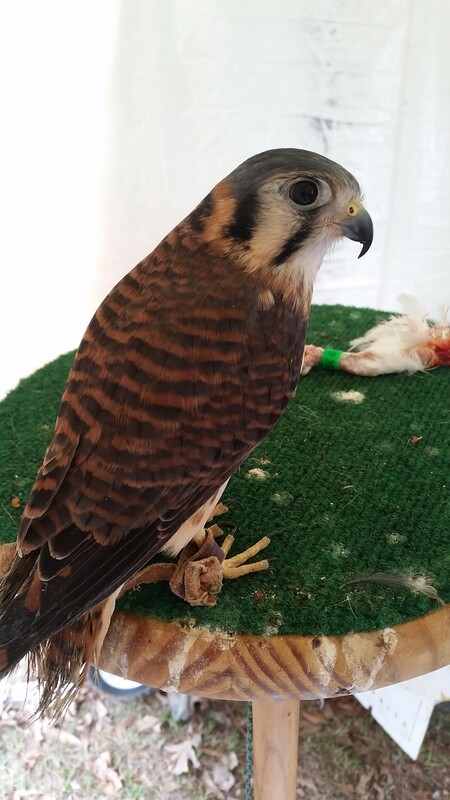 While on site the Gazette interviewed Master Freiderich, the Gulf War Falconry Coordinator, and Lady Lora Ann. They taught us the difference between a falcon and a hawk, spoke about falconry as a blood sport in SCA period and also about the modern process of becoming a licensed falconer in the United States. From October to March they hunt with the birds about 3 times a week. In April the birds molting brings the hunting season to a close. 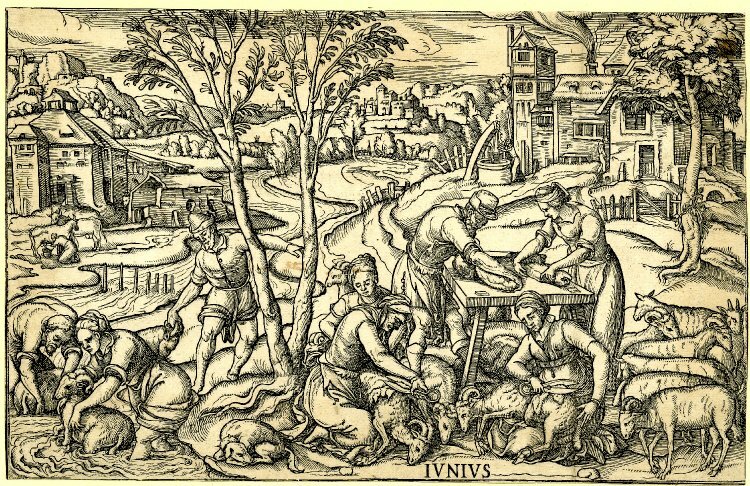 Most magically, Master Friederich, Lady Lora Ann and another falconer from Trimaris allowed visitors to the mews to hold the falcons on their wrists. All who saw the raptors were charmed by their beauty and grace. 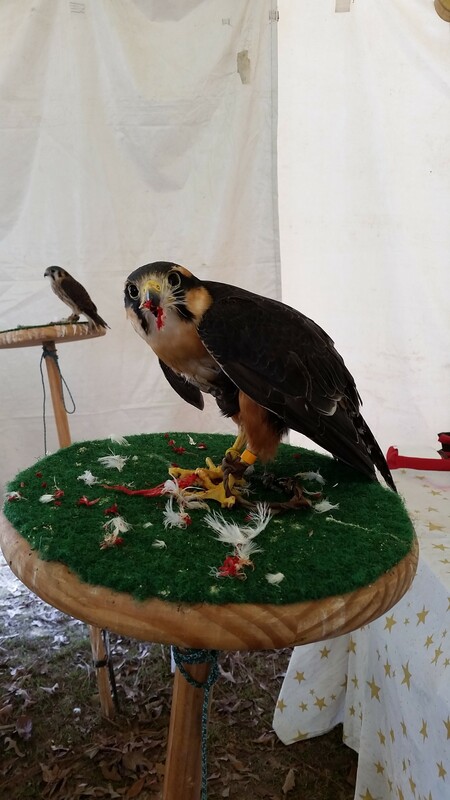 Both Her Majesty Thyra and Her Highness Etheldreda visited the Falconry tent, and many members of the populace posted photos and stories of their experiences to Facebook, considering it one of the highlights of the event. 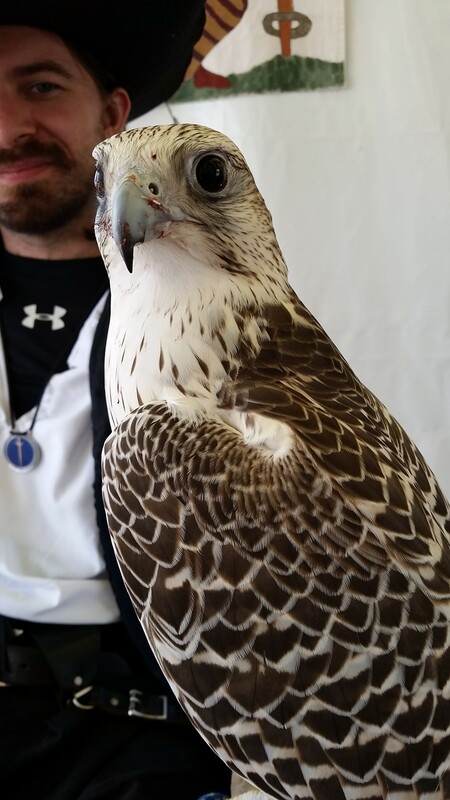 Winter, a 4-year old Gyrfalcon. Held by Remy Delamontagne de Gascogne. A fund to help the family of falconers has been set up by Lord Andromir Vukovic of Calontir. From the announcement posted on Facebook: ” The account is titled Falcon Fund. The intent is to collect funds to be dispersed to Lora Ann, Fredrick, and Liam (The Brooks family) via their bank account or to a disposable gift card. This is a convenient way to those in and out of Kingdom to show their kindness…otherwise, collection points for those wishing to give “made/purchased” pieces will be announced at a later time or you may contact me via private message. To connect to the PayPal account, the name is Falcon Fund and the email associated is andromirvukovic@ymail.com. Should you still wish to donate, but not via PayPal…contact me privately…”. Lord Andromir Vukovic, Mundanely known as Andy Cardin. Article text and photos were provided by Countess Marguerite inghean Lachlainn. Our thanks to Muirgheal inghean Domhnaill, for supplying this older photo of Artemis. This reporter is standing at Gulf War Opening ceremonies where the Peace Negotiations between Trimaris and Ansteorra have broken down. In an egreegious display of temper the King of Ansteorra Lachlann kicked grass on the shoes of the King Kurn of Trimaris. It looks like there will be War. The East has allied with Trimaris. There was much entertaining banter during the declaration. Calontir declared for Ansteorra after receiving from them amazing largess (Large S). Athelmaerc declared their sides after inspecting the jewels of both crowns and deciding it was better in Trimaris. Nous sommes présentement à la cérémonie d’ouverture de Gulf War, où les négociations de paix entre le Royaume de Trimaris et Ansteorra sont au point mort. Dans un flagrant mouvement de colère, le Roi d’Ansteorra Lachlann a donné un coup de pied et couvert de poussière les chaussures du Roi Kurn de Trimaris. Il semblerait que ce sera la guerre. Le Royaume de l’Est s’est allié avec Trimaris. La déclaration fût marquée par d’amusantes badineries. Le Royaume de Calontir s’est déclaré du côté d’Ansteorra après avoir reçu d’eux d’impressionnantes largesses (Large S). Tant qu’à lui, le Royaume d’Athelmaerc, pour déclarer son alliance, a inspecté les joyaux des deux couronnes opposées, avant de décider que ceux de Trimaris étaient mieux. The following was published on Thursday, November 6th to the SCA Announcements email List (announcements@lists.sca.org). 2016 – Due to special projects, all 2016 meetings will be held in Milpitas, Ca. You may also email comments@lists.sca.org. This announcement is an official informational release by the Society for Creative Anachronism , Inc. Permission is granted to reproduce this announcement in its entirety in newsletters, websites and electronic mailing lists. The Province of Malagentia, which include two incipient ridings, Giggleswick and Raven’s Bridge. It covers the southern part of the state, including Portland and Lewiston. The Barony of Endewearde, which includes two incipient cantons, Basingstoke by the Sea and Wyndriche. It covers the central part of the state. The Shire of Smithwick, which includes the northern part of the state. The Shire of Hadchester, which consists of mid-coast Maine. This status is the culmination of years of hard work. Vivant! Would you like beautiful SCA artwork on your walls? Want to explain what you do on your weekends to relatives? Show a friend why they should come to an event? Support the East? The 2015 Labors of the East calendar will do all this, and you have the chance to write a dedication for one of the months. The calendar (and also sets of note cards) will be sold starting in October to support the Royal Travel Fund. Each month features original calligraphy and illumination illustrating an SCA activity and a humorous poem written by Master Christian von Jaueregk. Want to dedicate the courtly love month to someone special? Perhaps your fighting household would like the month for Pennsic or a guild would like the month about their art? There will be space on each month for a dedication message and the name of the person or group sponsoring it. Sponsorship is $100 per month. If you’re interested, contact Lady Lucie Lovegood of Ramisgate (erin.neuhardt@gmail.com) or Mistress Catrin o’r Rhyd For (rhydfor@gmail.com). The subject of each month is listed below with its artists. More information on how to order a calendar will be available at the beginning of October.